The T-Mech 18V Cordless 2 in 1 Nail and Staple has extensive capabilities; nail/staple into plywood, hardboard, cardboard, wardrobe backing, picture frames, fencing, roofing, carpeting and underlay, blinds, fabrics and upholstery, ceiling tiles, plastic sheeting, or general craftwork. No matter what your project is, the T-Mech Nail and Staple Gun won’t let you down. 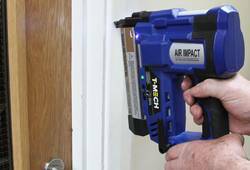 Charged by a powerful 18V 2000mAh Li-Ion battery, the Nail and Staple Gun is fully charged in just 50 minutes. From there, fire away at a speed of 60 nails/staples per minute! Choose between Single Fire or smooth and continuous Contact Fire for added speed and ease of use. Built-in Air Impact design and Depth Adjustment gives you dynamic control and precision placement whilst the two-part safety feature protects against misfire or accidental use.